Rich in Jewel Tones…the 1950’s Way! 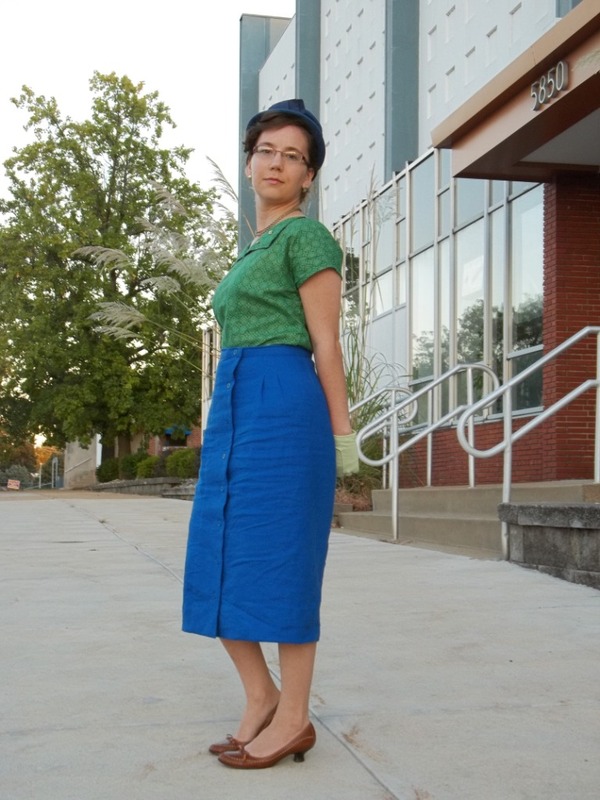 This outfit of both skirt and blouse is rich in mid-50’s style, deep color, quality fabric, and especially family memories and friendly connections. Would you believe two one yard cuts were all that I needed here? It’s true. Nevertheless, with two “Easy-to-Make” patterns I managed to have a hard time and make some “design opportunities” (a fancy phrase for a mistake). Sometimes with the simpler things there’s more room for error. What did go right for me is how the finished outfit turned out. 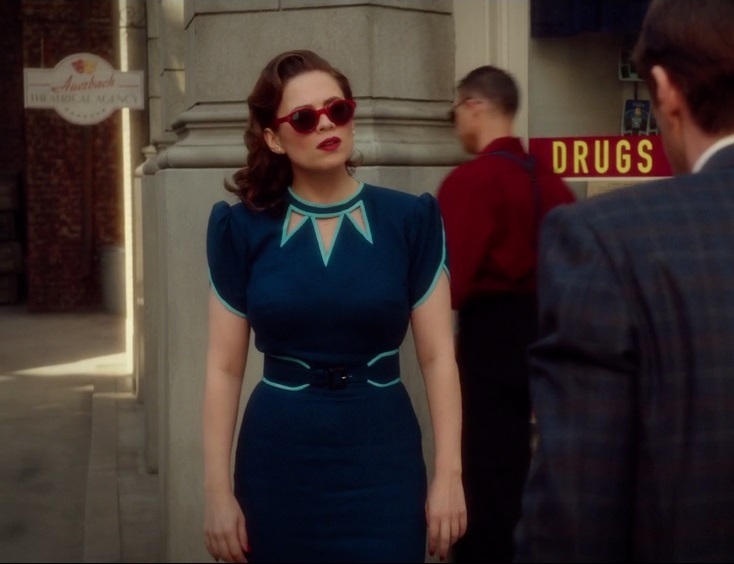 It’s perfect for flaunting my curves through clothes that turn me into a classic retro 50’s hourglass shape! 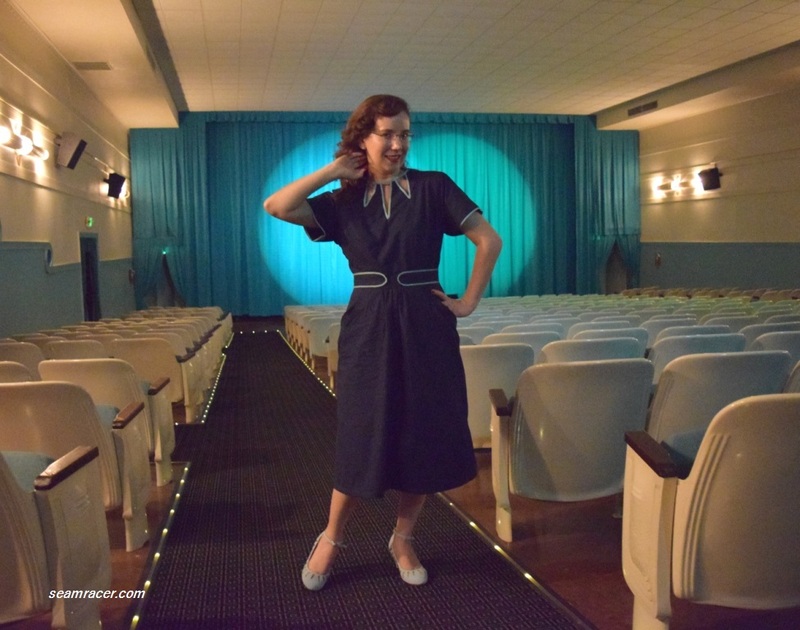 NOTIONS: I had everything I needed – thread, a zipper, interfacing, hook-and eyes, and buttons. 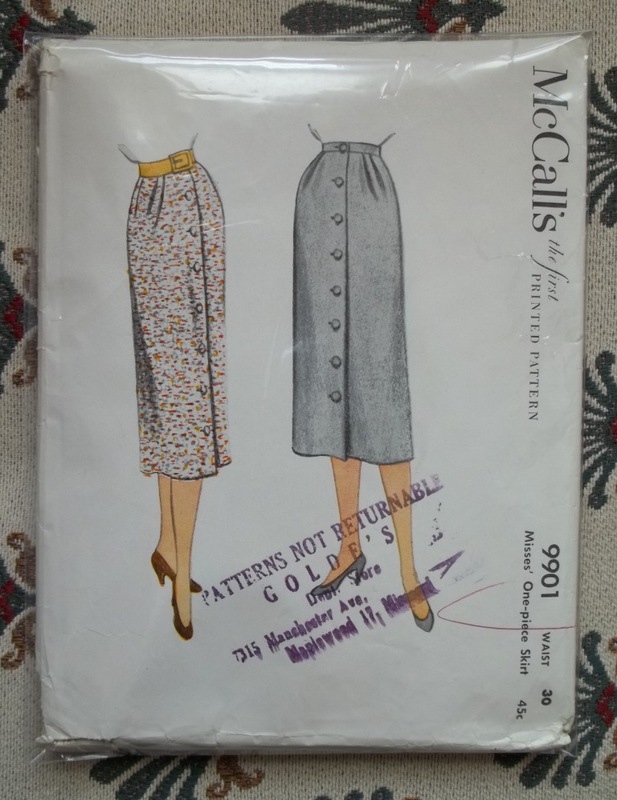 PATTERNS: The blouse was made using a “Quick and Easy” Butterick #7490, year 1955, and the skirt pattern was a McCall’s #9901, year 1954. TIME TO COMPLETE: The blouse was not as easy as expected, so it took me about 8 hours to make, and the skirt had maybe 5 hours spent on it. Both projects were completed on September 11, 2015. THE INSIDES: My blouse’s fabric is such a tight weave cotton and (for a ‘quick’ pattern) I took too much time on it the way it was. Thus, the insides are raw. 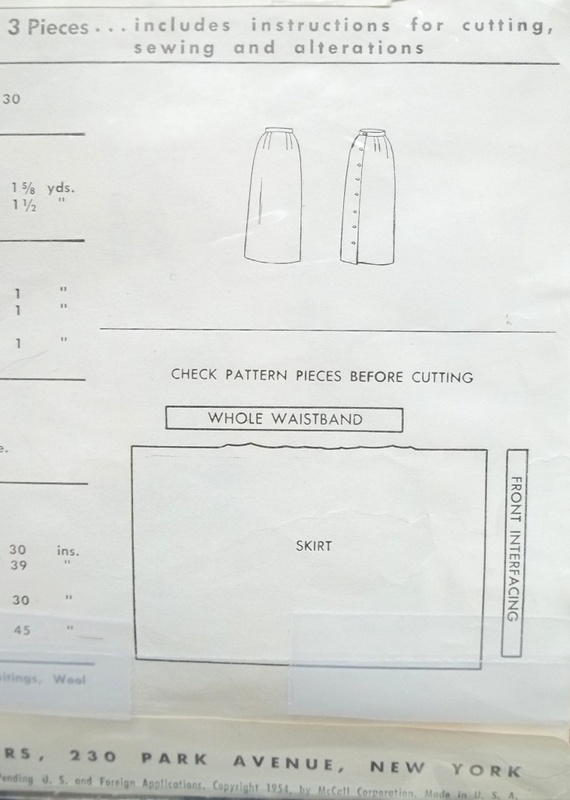 For the skirt, well…what insides?! This is a pun and rather ironic – I’ll explain lower down in this post. TOTAL COST: The linen was on an insanely super discount since it was a one yard remnant, and the blouse fabric was reasonable at one yard, too. In total I suppose my outfit cost me about $7.00. 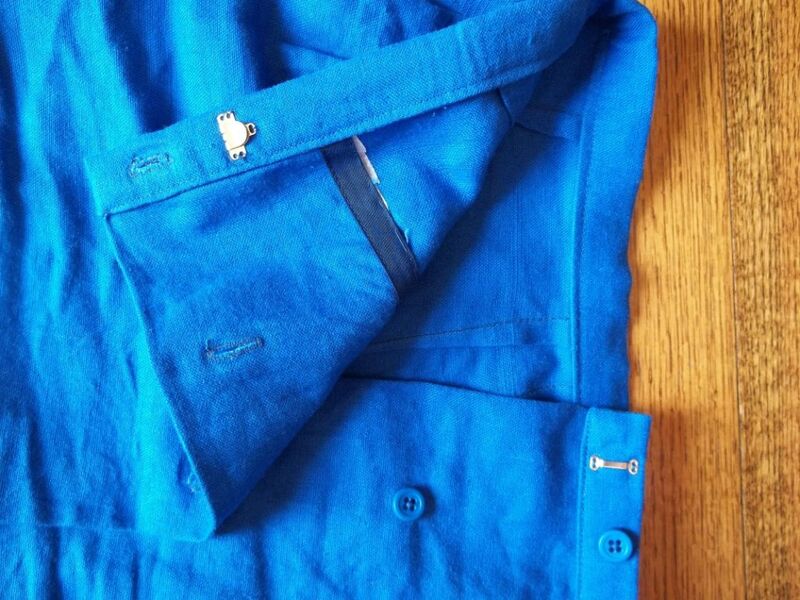 The blouse’s fabric really looks like something better than just quality cotton. It is such a deep green that, as a one-sided print, the white underside shows bleed through dye marks from the other side. A metallic gold is printed on top of the design to highlight the print and make this fabric appear as a brocade (this isn’t the first imitation brocade I’ve used for a 50’s blouse). However, this cotton is so much softer than any brocade could ever be, yet stiff enough to give a ‘crisp’ appearance, perfect for the pattern. My skirt is a linen, which is already a very nice fabric, but this is a type of linen that I’ve never seen or felt before…very luxurious. Some linens can instantly become wrinkly, feeling very rough to the touch or scratchy and even stiff – not my skirt. As a mundane description, this linen could be a blanket, it’s so plush and pliable but so thick (about 1/8 inch). Having a loose weave helps the linen not seem so overwhelming, though. Together, the two fabrics are in a dressy ensemble making me feel oh-so-put-together. They also are a very comfy set that makes me conscious of some very nice material. It’s like a treat for me to wear. For some reason or another, I was a bit off while sewing these two pieces, and so some boo-boos were made. I made the best of the mess-ups, although my mistakes on the skirt could not be recovered. When this happens sometimes, I find it’s best if you just go along with your mistakes, and make the best of them by letting them become part of the design, as if it was something intended. Above in “The Facts”, I mentioned the irony behind trying to explain how the inside of the skirt is finished. Well, there not a straight answer here, which is also directly part of my mistake. Somehow or another what was supposed to be the right side of the skirt became the wrong side, and the wrong side became the right. This might sound like an obvious thing I shouldn’t have missed, and it’s really not like me to do this. Here were some of the sources to my problems. The linen fabric itself has no right or wrong side but has the same finish and appearance on both sides, so the fabric was confusing me. The pattern itself is so simple. It is just like an enormous one yard square, to which you shape by sewing in a quantity of darts along the waistline, so it’s kind of like a wrap skirt. This made it hard to figure out sides, too, not to mention the possibility of my son running around inside with too much energy and my dog stepping on the fabric begging for attention. Cancel any undivided thought process. My mistakes with the fabric and the pattern would not have been a big deal if the vertical button plackets on the right and on the left side were not completely different from one another – the right side with the buttonholes is half as big as the left side with the buttons. 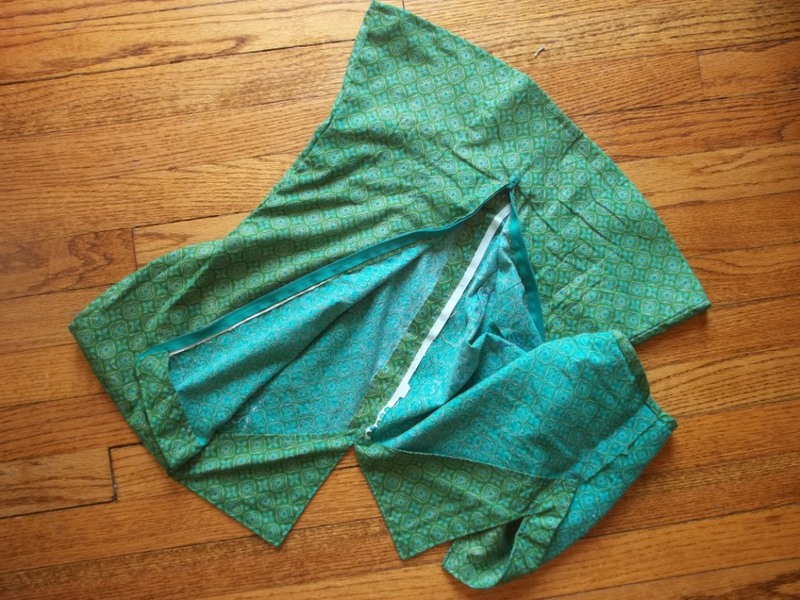 I did not realize my mistakes until all the darts were sewn and the interfacing ironed on – darn! The right still had to close over the left (I knew that much) but now the button placket is off center instead of centered. Oh well, it is now officially an asymmetric button front wrap…this is how I’m satisfying myself with the finished garment. Officially, there are no inside seams to the skirt and it is a very nice skirt, so mistake or not, I love it. The color and the weight of the fabric should make this an all-season piece. 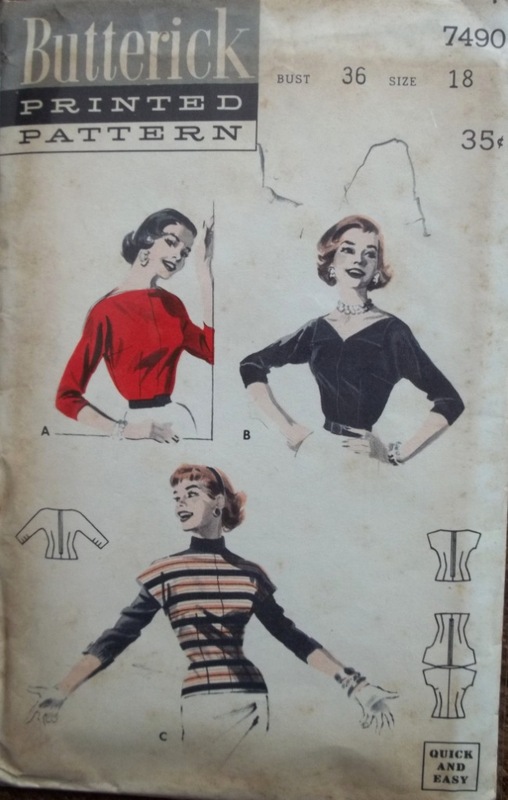 Happily, I looked at several other 1950’s era blouse projects I have lined up “yet-to-make” and they will all match with my royal blue skirt. 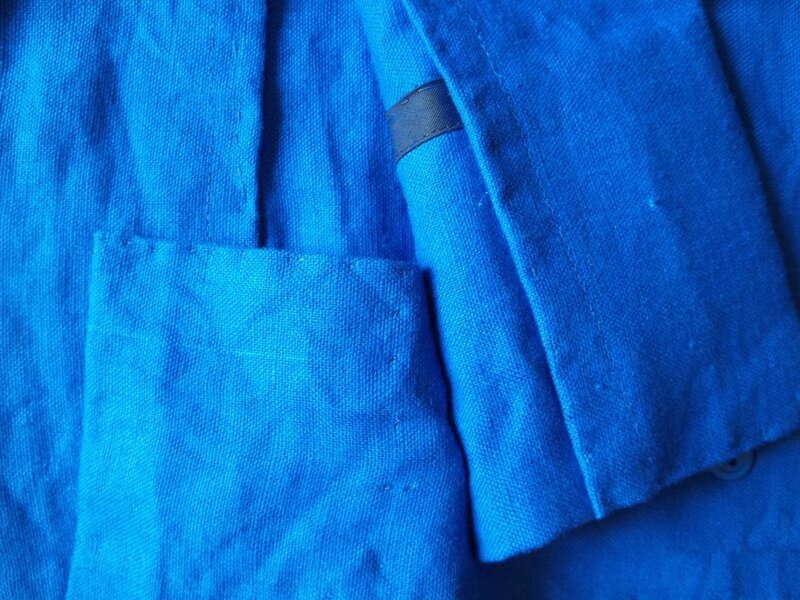 I did line the waistband and the front placket with a heavier weight interfacing than what I conventionally use. This makes the soft linen of the skirt adhere to the stiffer and straight lined look of the 50’s, at least in certain spots. 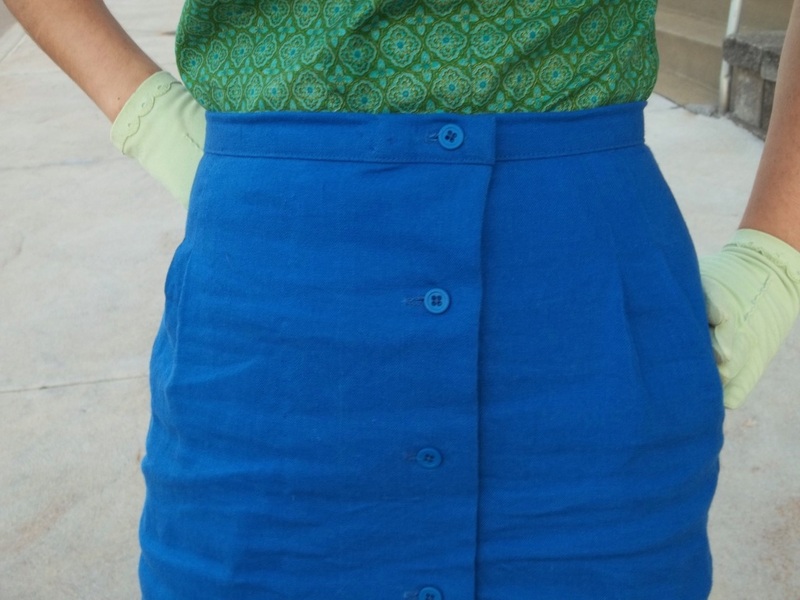 The interfacing also makes my skirt extremely hard to button as do the backer buttons I added for stability. I found this out after the fact. Oh well – the skirt sure feels secure when it’s on me! To top off the whole project, the bottom edge was extremely wonky. Two inch hem here, three- something inch hem there – the line was all over the place! To have a straight hem I had to measure down from the waist all the way around and hang the skirt up while I sat the bottom of it hand hemming with a ruler at my side. Sorry if I sound like a ninny, but usually hems are much easier than this. 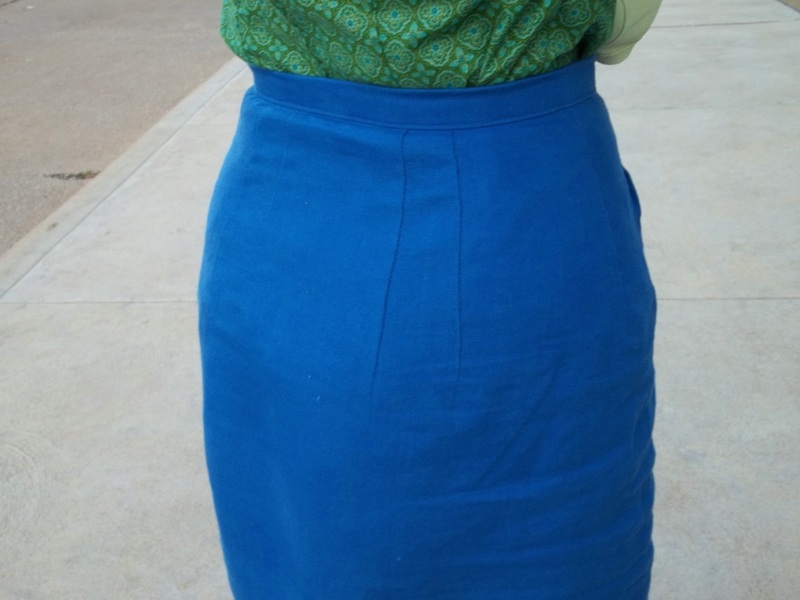 That’s o.k., I was forced to give this skirt a nicely finished invisibly stitched hem finish like it deserved. Now, the blouse has a wide bateau neckline, classic ‘50’s kimono sleeves, with what the pattern back calls a “pie-cut neckline with modified wing collar.” I’ve never seen a blouse with open lapels called a “pie-cut neckline” but it’s a cute term and I sort of like it because it reminds me of yummy food. 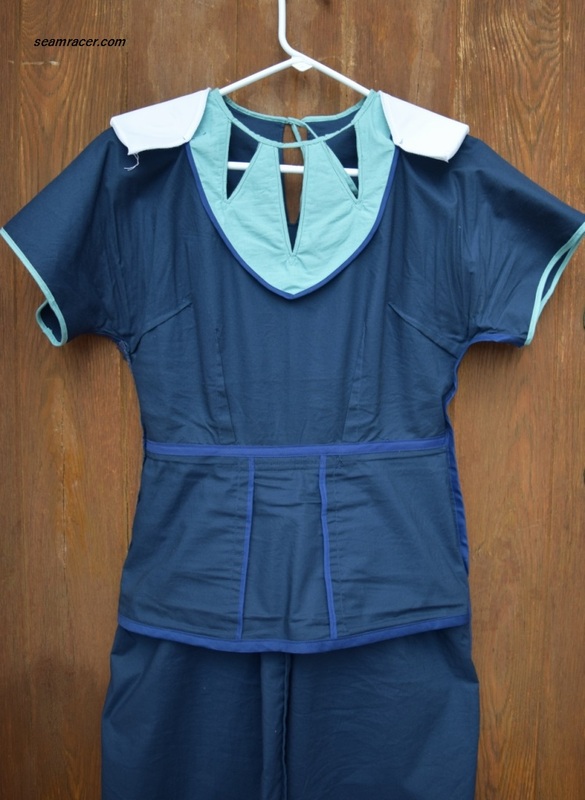 The back design made me highly doubtful it would work with a closed end zipper ¾ of the way down the center. Below the hips the fabric is together. I wondered why there is this strange layout. 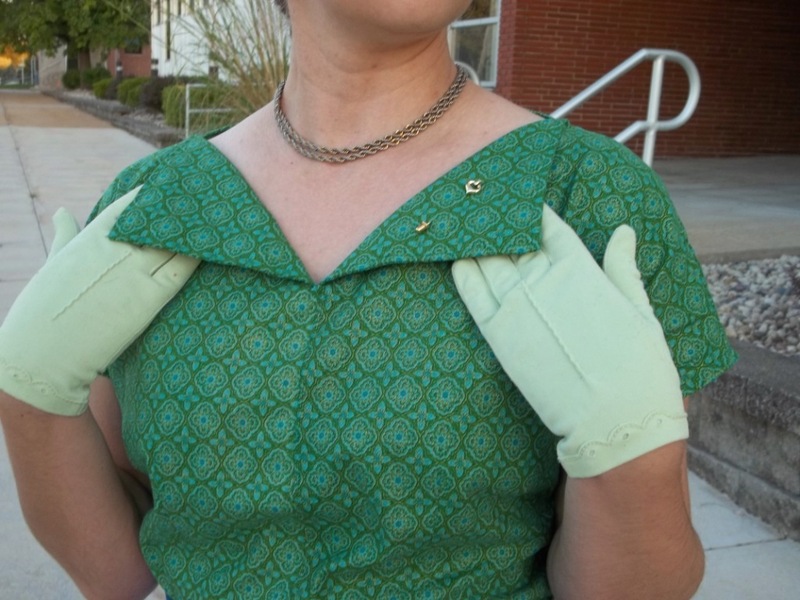 Separating bottom zippers (like on a coat or jacket) were invented already, but maybe they weren’t readily available to the home seamstress or perhaps just too expensive or bulky to be practical. Anyway, the closed bottom to the top isn’t a problem – it just makes it more of a ‘step-in’ garment than something which goes over the head. My main problem with the “easy” blouse was mostly because of a slight fault in my work of down grading the pattern to my smaller size. I figured out how much to take out and where to hack it out, but I didn’t re-slope the shoulders and take off some of the length. 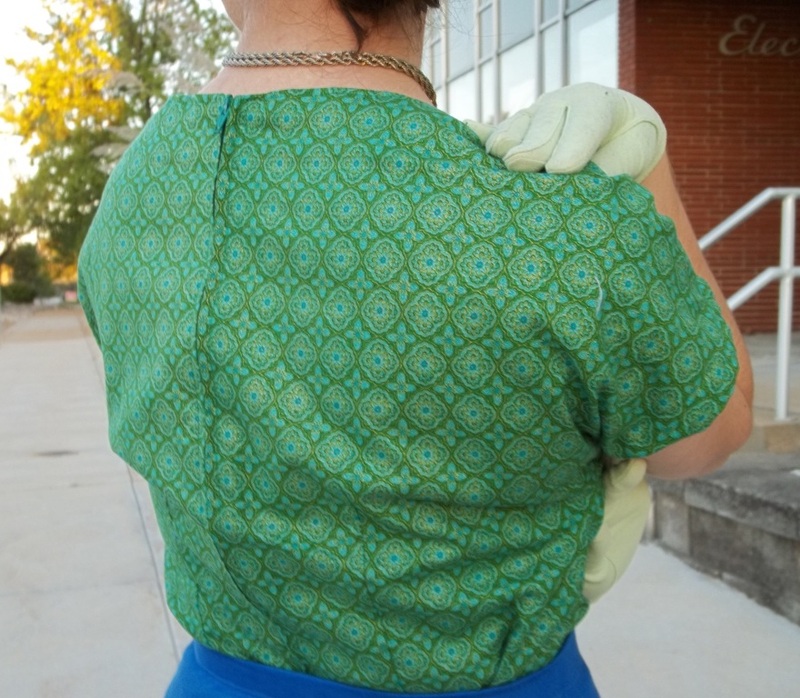 Thus, after my blouse was quickly done I realized there was too much room between the shoulders and the waist, creating a bubble sticking out of my back with the zipper. Yuck! So I went to work doing my least favorite thing to do in the sewing sphere…unpicking. I took apart almost all of the tricky facings and all of the zipper, then cut off about 1 ½ inches from the top edge to bring the neckline down. Now I could re-sew those tricky, sharp cornered facings and the zipper back down again for a no longer easy basic blouse. That extra time and effort sadly was really necessary or I wouldn’t like my new top and therefore not wear it – so is life with sewing! Tailoring takes effort but has its reward, too. The sources and history to both patterns is part of the “family and friends” goodness to this ensemble. 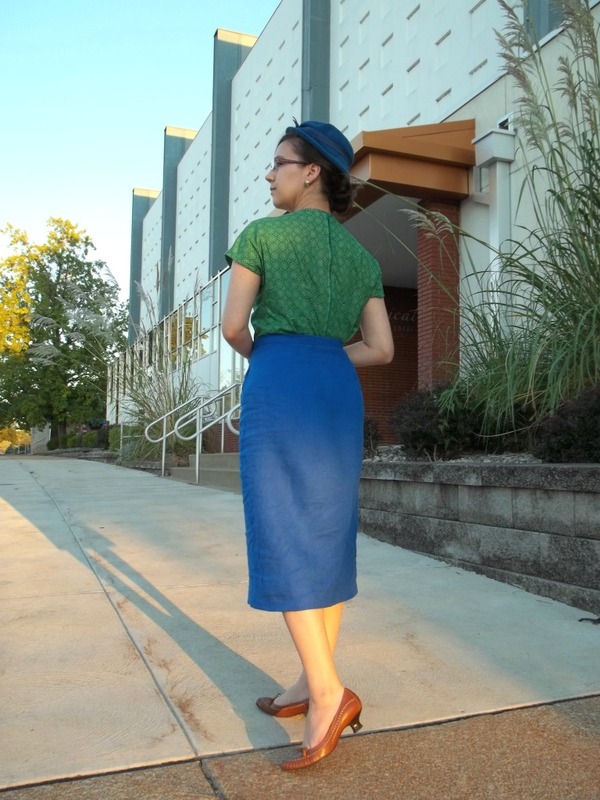 The skirt’s pattern was found at a nearby vintage/antique store, and picked out by me on my birthday as my own present. On the front there is a stamp of “Goldie’s Department Store, Maplewood, Missouri”. Hey, hey, Maplewood isn’t too far from us. So I spoke to some family and did some Google searching about the town to find out a rich, local history to Goldie’s owner and it’s multiple stores in the area. The Maplewood location, burned down in 1966, was at a part of town that I already know and love to visit. My Hubby even remembers going to get his boy scouts uniform at one of the last surviving locations. Neat! 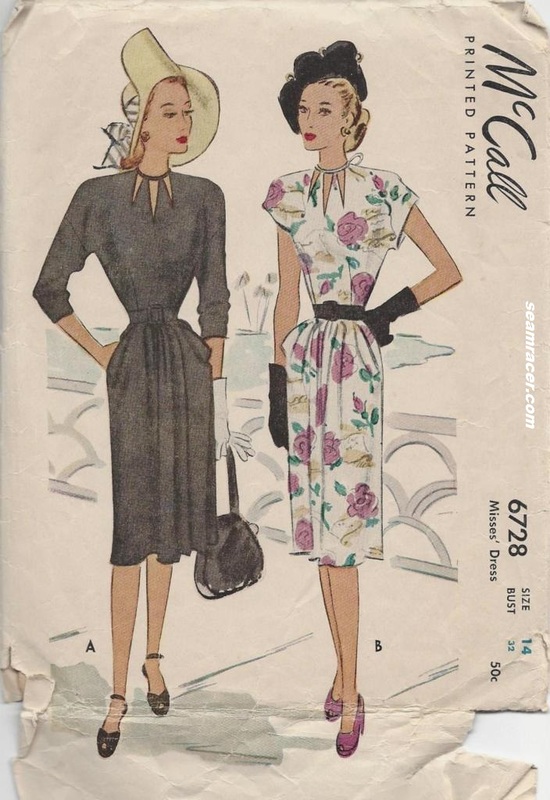 This makes it a local pattern which actually stayed in town, and came from a store family members have memories of, just like the one I used for my 1944 dress (post here). The blouse’s pattern was given to me from a close friend of mine who shares many similar interests as myself, among which is sewing. 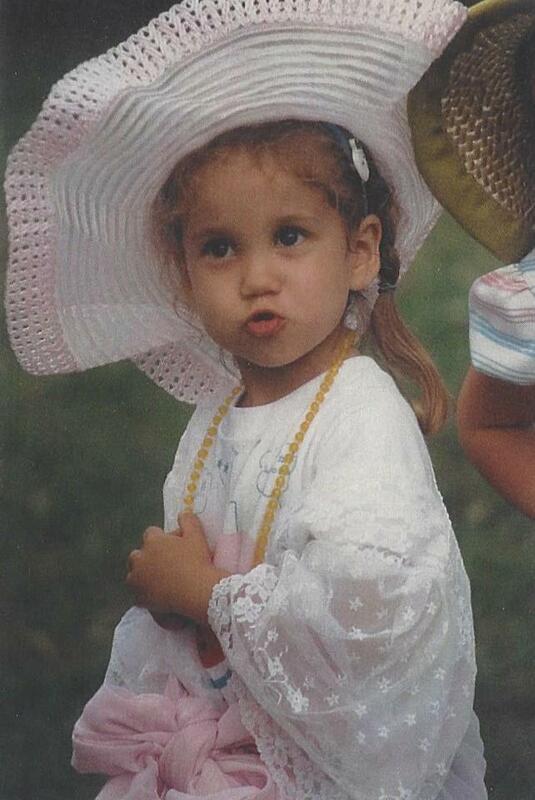 Yup, this is me at 3 1/2 years, playing dress-up! 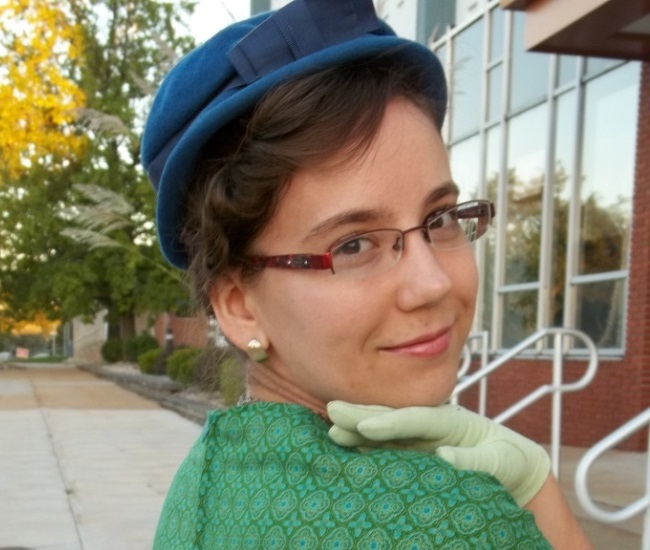 My blue wool hat is the most special part of my outfit. I’m so proud! It is from my Grandmother. This is the same hat I remember when I would go over her house as a little girl and play dress up with my cousins. She would let me put on this very hat, among others too, and now that she has given it to me, I can again wear it for some grown up serious dress up time. Unfortunately, my parents can’t find, but do remember a picture of a mini-me in this wool hat. However, I do have a picture of myself from one of those dress up parties (see at right). I suppose my love of having fun with fashion and enjoying making my own look hasn’t died back one bit since then. Thank you Grandma for those times…and the hat! 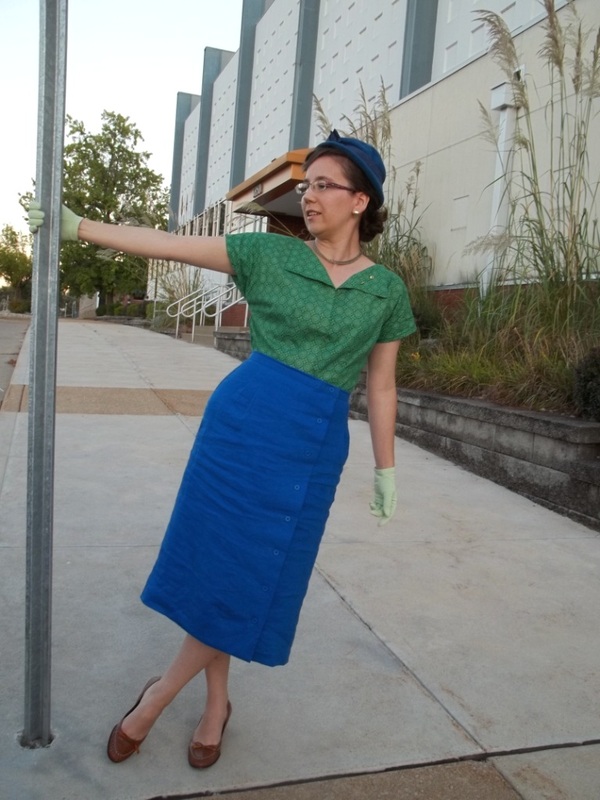 Our photo location was at a gloriously stern but bright early “Mid-Century Modern” building built during the boom our neighborhood experienced in the 1950’s. I think it lends my outfit a business-like, professional aura. Besides, I love architecture appreciation! See? Money isn’t necessary to look like a million – just a little talent, a sewing machine, some ideas and creativity…viola! It is so much easier than many realize to personalize one’s style be the master of your own fashion and do it all on the cheap. 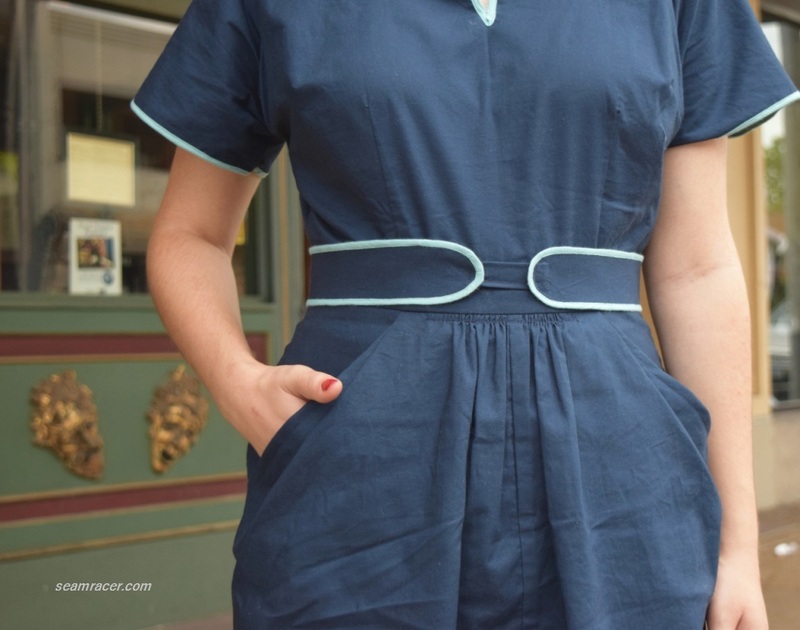 Look what two one yard cuts of fabric did for me in this post. Do you also love the freedom and enjoyment which comes from sewing your own clothes? Better yet, do you also have a family memory attached to a particular outfit you’ve made?